When it comes to holy grail, super duper, mega key issues, Tales of Suspense #39 falls perfectly into this category. 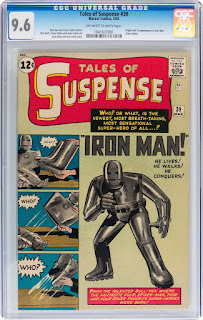 ToS #39 has the first appearance of Iron Man. He was created by the legendary duo of Stan Lee and Jack Kirby. He has been a popular character for a long time, but has become even more popular after the movie starring Robert Downey Jr. was released in 2008. 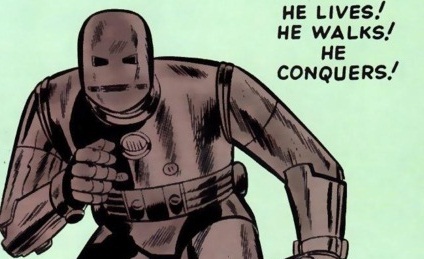 The movie pushed Iron Man into the mainstream and made many more people aware of the character, and his first appearance has seen a huge boost in demand because of it. As pretty much everyone knows by now, Tony Stark is the Invincible Iron Man, and this issue has his origin. To summarize what happens in this issue, Tony Stark goes to Vietnam to test a new weapon he's been working on. The test goes well but Mr. Stark ends up getting captured by Wong-Chu and his Red Gorillas after setting off a booby trap that caused a big explosion. Shrapnel from the explosion got lodged dangerously close to his heart giving him only a short time to live. Wong-Chu, knowing that Stark is not long for this world, demands that he build a weapon for him. He lies and tells Tony that if he builds this weapon, that he will perform a surgery to save his life. They both know that's a lie but Tony agrees to make the weapon anyway, but he doesn't build any weapons like he promised. With the help from Professor Ho Yinsen, also a prisoner of Wong-Chu, they built the Iron Man armor. Not only is the armor super powered, it's also what is keeping Tony Stark alive. Now to spoil the ending, Iron Man winds up defeating Wong-Chu and has the Red Gorillas fleeing into the jungle. Let us now take a look to the almighty CGC census. There are surprisingly a good amount of copies graded already. So far there have been 1,657 copies. Most of these copies are of lower to mid grade, but there are a few high grade copies too. 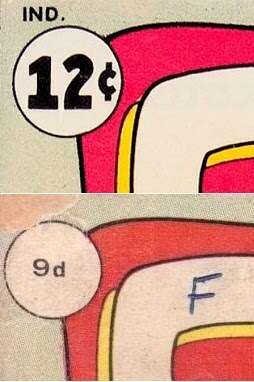 There are 4 copies graded at a 9.6, which to date is the highest grade there is for this issue. There is also a UK "pence" version of this comic. These pence copies don't sell for the same amount as the U.S. versions do. They have a much smaller print run, but are also usually much cheaper. There is a small niche of people out there that collect these foreign copies, but most people, myself included, prefer the U.S. copies. The difference on the covers is small, but obvious as shown in the picture to the left. I only mention that so that you'll be aware of it and not purchase a UK copy by mistake. Back in 2012, one of the high grade 9.6 NM+ copies sold for a massive $375,000 on ComicLink. Another copy sold for a much lower $262,900 at Heritage Auctions later that same year. I have no idea why there's such a big price difference. However, in early 2015, another copy sold for $300,000. With such high sales for high grade copies, you can expect low grade copies to be a bit on the pricey side too. Looking at the data on goCollect, the last sale for a graded 8.5 copy ended up selling for $22,855.57 back in Feb. of this year. That's a huge jump from the $13,500 that sold only two years prior in May of 2014. Even looking at VG 4.0 copies, sales have jumped almost two grand from $2,175 to about $4,000 over the last four years. Even the ultra low grade 0.5 copies are selling for over a $1000. 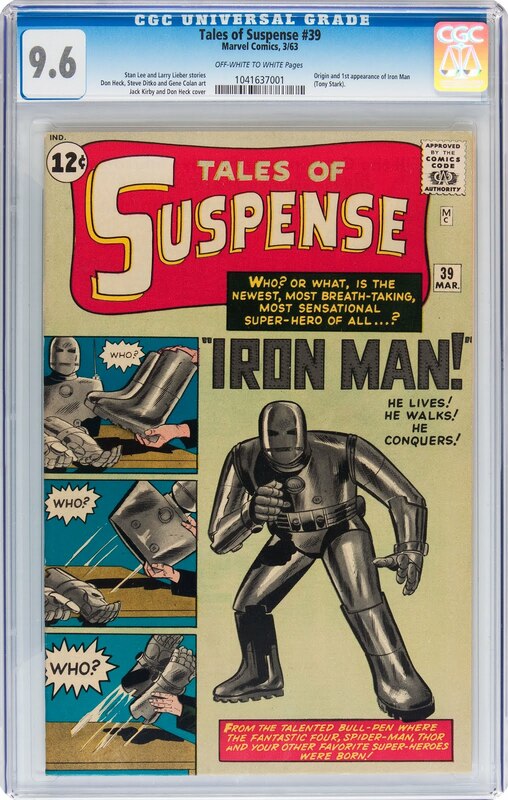 There are a lot of graded copies floating around in the market right now and it isn't hard to find one for sale, but if you decide to add this comic to your collection, expect to shell out some serious dough for it. If you don't mind foreign copies, maybe you can find a good deal on the UK version, although they are much harder to come by. Or maybe you can take a chance on a raw copy and hope that it hasn't had any restoration done to it. I leave the decision to you and wish you luck on your quest.